As promised from my tweet yesterday, I have to blog about the crazy experience yesterday afternoon involving rescuing a little wren from Gooch Hall. It all started when I went to Gooch to meet with Kristy Crawford and Michael Poore from the College of Education/Education Department. We ended up rescheduling the meeting for today (Thursday) instead, but since I was already in Gooch I decided to see if Tomi was around in the Communications Office or if anyone was at The Pacer office. I was about to leave by taking the stairs near the vending machines on the third floor when I was startled by a flapping sound. But against my first instinct to just leave the building and let the bird die, I decided to try to work it toward the balcony doors to free it. I figured I owed it to bird-kind…since last week I accidentally hit one of those suicidal birds that like to fly across the street at the exact same time that cars are coming. I also thought Karen would be impressed at my humanity…and it did seem pretty inhumane to just not do anything. Well…needless to say, it is practically impossible to get a bird to do what you want it to do. I probably spent 10 minutes walking slowly after the bird in the hallway outside of the Comm office. It would fly from the vending machine area (where there is a large window, but like every single window in Gooch, it doesn’t open!) down the hall to the stairwell where it would sit on the door or the handrail. Three or four times I walked toward it in the stairwell only to have it fly back down the hall toward the vending machine area with the window. Then I got the idea to try to work it downstairs. (I don’t know why I thought this was a good idea.) When I got to the stairwell on the third floor, I tried to fill the doorway by holding up my arms and it actually worked to get him to go down the flight of stairs instead of back over my head. But then things went wrong… it flew down the hallway toward the second floor vending machines (the layout in Gooch is basically the same on each floor in case you didn’t know). So I went after the wren again, and this time when he flew away from the vending machine/window he landed in a fake tree at the corner of the hallway. As I approached the tree, of course, the wren flew out and back down the hallway. Only this time…he stopped on the door frame of an open office! (At this point…I thought “Oh crap. I just made this somebody else’s problem.”) I went to the office where a professor (I think?) was reading a book. She must have been really engaged in the book, because she didn’t hear the bird fly into her office and she didn’t even hear me walk in until I knocked at her door. “No…” Then I pointed it out to her. After the screaming, the people in the office (Jennifer, Jenny Hahn and Debbie Stigall) were kind of frantic, and I heard Jennifer tell them that a bird just flew in their office. So I ran down the hall and entered the ESS from the other door (the one the bird didn’t fly through). They quickly told me that there was a bird in their office…and I, of course, trying not to laugh, told them that I had seen the bird fly in through the other door. 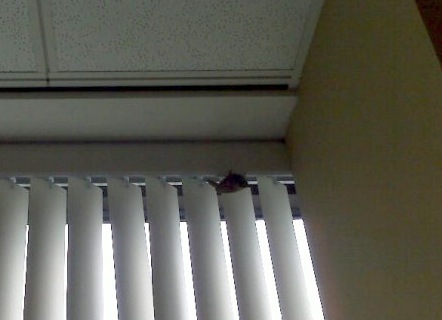 To make a long story a little bit briefer, we managed to get the bird out of Jennifer’s office, only to have it fly in Jenny Hahn’s office where we closed the door to make sure it wouldn’t get out. Armed with a sweater and a plastic cup, Ms. Jenny and I tried to catch the bird but to no avail. It kept flitting from the window to the door to sit on some hangers on the back of the door, then back to the blinds…it was interesting to say the least. After a few minutes, we rushed out of the office, closing the wren back in, to try to figure out what to do next. I told them that maintenance wouldn’t do anything about it, so while Ms. Jenny went down the hall to the Dean’s Office to fetch a grad assistant, Jennifer called the Biology and Ag departments. None of the professors were in (keep in mind that it was 4:30 by this point and it’s summer term). She was about to call Dr. David Pitts, a biology professor with lots of birding experience, at home. 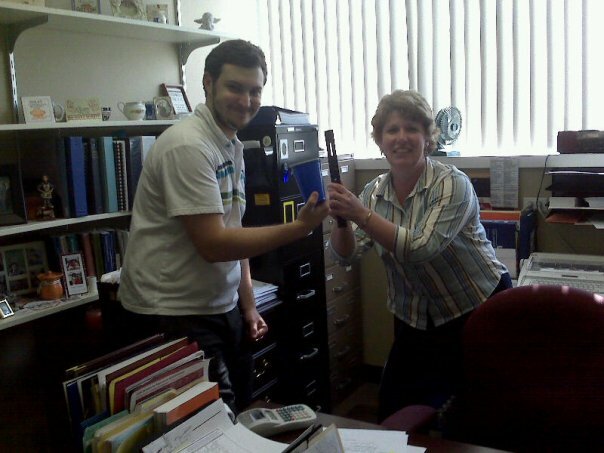 But in came the graduate assistant from the Dean’s office. He walked very calmly toward the office and closed himself in with the wren. We heard lots of interesting noises, some of which involved the bird flying from blinds to hangers again and the opening of an umbrella. A few minutes into this, Ms. Jenny walked back into her office to try to help. After a few more minutes, Ms. Jenny opens the door and the grad assistant has the wren tightly in his hands. The umbrella is open on the floor in the office. I’m both impressed and curious how he caught the wren, but evidently he has some experience with birds. He let it outside Gooch Hall, where hopefully it can now live in peace. As for me — well let’s just say that I don’t plan to take up the bird catching business.